Building design modifications and renovations proposed for the Grand Flamingo Condominium took a backseat to discussion of traffic patterns at this week’s Design Review Board meeting. Both Michael Larkin, attorney for the Flamingo, and James Murphy, Staff to the DRB, described the backup of rideshare vehicles from the property onto Bay Road as a problem “plaguing the area”. 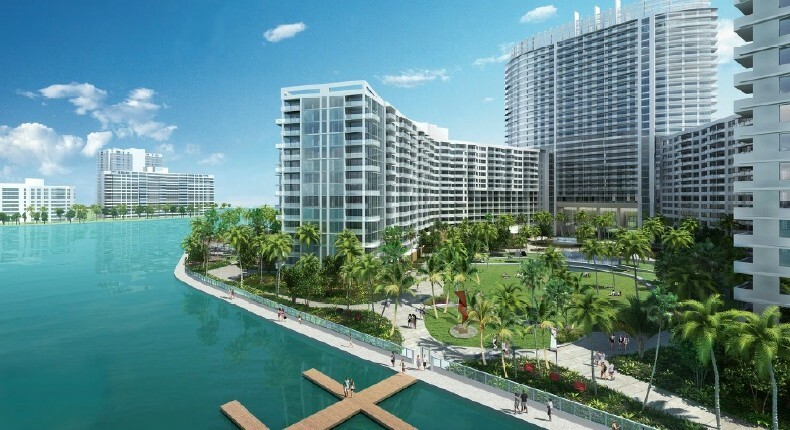 Plans for the property include the removal of the security guardhouse and gate with pickup and drop off points for rideshare and valet located at the North and South Towers. As part of the changes, an urban plaza will be created with retail that is open to the public. Earlier this year, we reported on the concerns of nearby residents who said the backup created safety hazards for pedestrians as well as vehicles. Architect Jon Cardello of Stantec Architecture said creating the plaza “improves the quality of the engagement of the residences across the street and it really creates an activated place which is for people and green space versus vehicular movement. We think that’s a substantial contribution to improving this project.” As part of the renovations of the North Tower, Cardello said, units will be enlarged, reducing the unit count in that building by 168. A restaurant may be located on the plaza with conditions as agreed to with WAvNA. Those include restrictions on hours: Sunday through Thursday 7 am to 10:30 pm, Friday, Saturday and the eve of holidays, 7 am to 12 am; outdoor seating limited to 40 seats and a total of 120 for the restaurant; no outdoor speakers, ambient background music only indoors, no live music or DJs; acoustic absorbing materials on walls, double door vestibules with the exception of emergency egress doors; no special event permits, no entertainment or dancehall license; and no outdoor bar counter. City Transportation Manager Josiel Ferrer told the Board, “We’ve worked so hard on this application, more than any other that we’ve worked on in my tenure here. I think it is a vast improvement over current conditions, if you know the current conditions there. Now people essentially stop out on the street because they’re not allowed access to that central guard gate.” By dividing the demand between the North and South Towers, there will be enough stacking for rideshare, valet, and parking for the retail and restaurant. That said, Ferrer said he had concerns with the South Tower plan and wanted to be sure that stacking will not flow out onto the street. Larkin provided a revised plan to address Ferrer’s concerns and discussed the urgency of approval given the upcoming Bay Road construction starting in January. The Flamingo wants to do their construction at the same time to minimize the disruption to the area. After discussing concerns raised by the Transportation Department with regard to the traffic pattern on the south side of the property, the Board approved the plan with the conditions outlined by Staff and those agreed to with WAvNA and directed the architects to work with the Transportation Department to resolve the remaining issues. Clarification on the South Tower transportation plan will be approved at the staff level. The property is located at 1420 Bay Road.